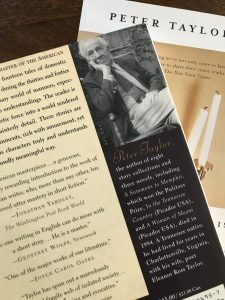 Pulitzer Prize winner, Peter Taylor is a writer I did not know about until one day, when walking my dog in the forest, I was listening to The New Yorker Fiction Podcast. There he was, being read by Marissa Silver, a young woman of her own literary prowess, talking about this remarkable writer who is able to to, “take the smallest moment and explode it into an entire world of feeling.” Such was the case with his story titled Porte Cochere (translated to mean: a drive under, or carport). This story can be found in the collection titled The Old Forest and also if you click here. At the Studio, we read this story and discussed where Taylor takes the reader, how he goes all the way with Old Ben, revealing a man tormented by a childhood trauma to the point that he brings that pain forward and gifts it, a horrible gift, to his own children (who no doubt, gift it in turn to their own children). It is a heart wrenching but necessary story for memoir writers to read, in order to see how it is done. Taylor is so skillful, so deft, so simple and yet, so complex. You cannot help but be left in a state of awe by his talent and also be inspired to push yourself to such heights.